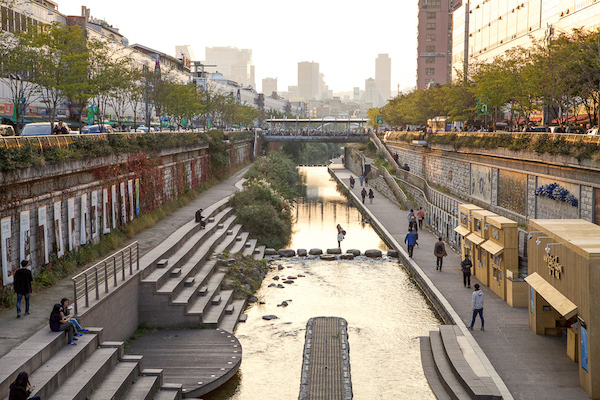 Cheonggyecheon Stream is a 10.9 km path, part of a major urban renewal project opened in 2005. It’s a great spot to walk or run right through the heart of the city. Much of the path is below the roadway, passing under 22 bridges, making for a tranquil spot among the bustle. The trail starts at the large Cheonggye Plaza, a bustling shopping and nightlife area, and runs east, passing near some of Seoul’s important sites, such as Deoksugung Palace, Seoul Plaza, the Sejong Center, Insa-dong Street, Changdeokgung Palace, and Changgyeonggung Palace, making for a good ‘runseeing tour’. It is about 3km (2 miles) to Dongdaemun Design Plaza, and about 6km to Yongdu. The waterfront area has become a popular area for culture and nightlife. Candle Fountain, features magnificent lighting fixtures and a 4m high, two-tiered waterfall.